← Eight year old José André recorded his first jazz album! Internet infrastructure in Bolivia is hugely undeveloped and by far the worst in Latin America. Prices are sky high so home connections are out of reach for most of the population. Only 5.4% of Bolivian homes are online compared to the South American average of 42%. To compensate, Internet cafes are on every corner and offer an affordable rate of around US$0.30 per hour, however connections can be painfully slow and you’ll likely be sitting next to a group of screaming gamers. 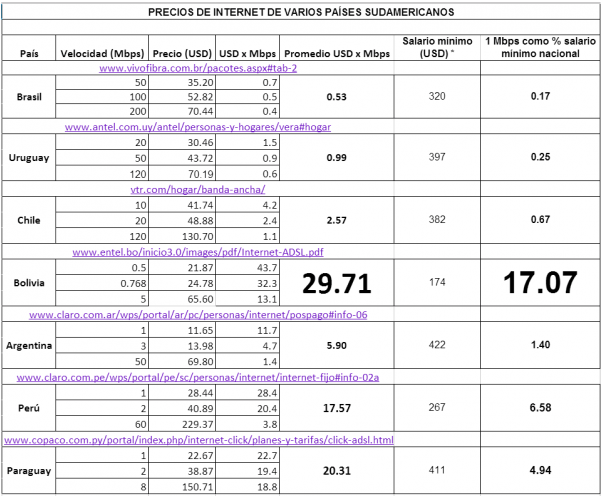 A lobby group called Mas y Mejor Internet Para Bolivia (More and Better Internet for Bolivia) has put together a chart which shows costs and connection speeds here compared to our neighbours. It’s in Spanish so I’ll explain the gist of it. They compared the cheapest Internet Service Provider (ISP) from each country in South America and calculated the average cost of a 1MB connection. Bolivia comes in as the most expensive by a long shot, at an average of US$29 per 1MB per month. They then compare the average cost per 1MB connection to the minimum wage (right hand column). As you can see Bolivia is getting royally screwed in this respect, paying 17% of a minimum wage just to have basic home internet. This would be the equivalent of an Australian paying $425 per month for a (lousy) 1MB connection. No wonder so many people here go to internet cafes. Unfortunately, the reality is actually much worse. Entel’s ADSL plan (which is used in the chart) is so popular for being the cheapest that it’s literally not available anywhere in La Paz. When I asked about availability an Entel employee told me to “come back next year”. So the prices shown in the chart are only really available to a small lucky few and what’s actually available costs substantially more. ADSL is so limited that almost everyone is forced to rely on mobile internet, ie Wimax or 4G. Earlier in 2014 Entel were the first to introduce a 4G LTE package including a wireless router. They advertised the product as cutting edge, where as in reality it’s been available for years all over the world. At just under $30 per month for a 1MB connection it was excellent value by Bolivian standards. However word quickly got out and so many people signed up that their systems have become heavily saturated (overloaded). During peak hours there is no point going online at all. Another major problem over here when trying to find an ISP is that there are no regulations governing minimum connection speeds. It’s legal to advertise a connection as 1MB if it can occasionally reach that speed, even if it usually hovers around 56k (ie dial up speed). Disturbingly, there are ISP’s out there that still offer dial-up connections. Other ISP’s offer Wimax or 4G LTE alternatives that are a lot more reliable. Because they are a lot more expensive hardly anyone uses them so their systems don’t tend to become over saturated. If you’ve bothered to read this far you might researching ISP’s for yourself so I’ll list the main options. There are other plans apart from those mentioned, click the links for more info. *unlimited plans tend to half your connection speed after a set cap, ie 75GB. A lot of people here buy internet for their mobile devices and use them to create a wireless hotspot to share with their family. This costs around US$20 for 3GB for 30 days. I use Entel and their 4G is fast enough for my needs. This entry was posted in Bolivia, Business, Economics, Energy, Politics and tagged communication services, competitiveness. Bookmark the permalink.